Follow Rt. 18 North into Old Bridge and exit at ramp for Rt. 527 Old Bridge Turnpike. Make right at end of ramp onto Old Bridge Turnpike. Make left at traffic light onto Bordentown Avenue. Follow Rt. 18 South into Old Bridge and exit at ramp for Amboys / Spotswood. Make left at end of ramp onto Bordentown Avenue. Proceed through traffic light continuing on Bordentown Avenue. Continue down Bordentown avenue approximately 3.6 miles. Make right into #3018, The MSTC Theatre / Garden Friends Day Care. Make a left onto Bordentown Avenue. 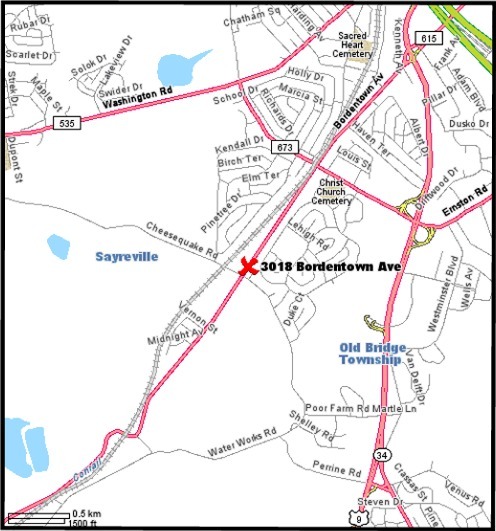 Follow Bordentown approximately 1000 feet. Turn left into #3018, MSTC Theatre / Garden Friends Day Care.